Maybe you’ve read about the fatal horse disease currently raging in the west called equine infectious anemia. Many horse people know it as swamp fever. There is neither a vaccine nor a cure. The sick horses suffer from intermittent fever, they are depressed, they grow progressively weaker, they lose weight, and they have anemia and edema. For a more technical description, go to http://www.ag.ndsu.edu/pubs/ansci/horse/v1195w.htm. Let’s think of those horses and their desperate owners today, and hope that veterinarians find a solution soon for this terrible scourge. 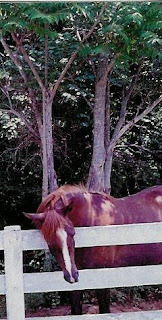 This entry was posted in Diseases, Equine Healthcare, Horse People, Veterinarians by MMFisher. Bookmark the permalink.